Summer has already started in India and temperatures are hitting triple digits in Visakhapatnam and Hyderabad. You get to make lots of pickles and papad’s around this time and you also get to enjoy all those juicy mangoes, melons and all other seasonal fruits. When you go to farmers market ( AKA Raitu Baazar) early in the morning , you get really good farm fresh veggies right from the fields. But the variety is limited during summer. Besides root vegetables, cabbage, tindora, eggplant and few varieties of gourds and leafy vegetables are available all year around. Pulses/Lentils are the best alternative. They are consumed to a great extent in summer. Lentils and veggies combination are very popular in southern part of India. Different varieties include pappu, pulusu, pachadi, podi and pappu korra. 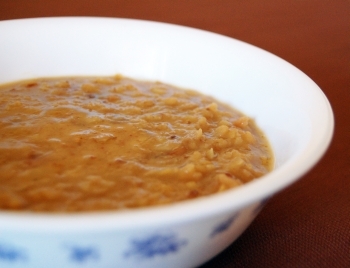 Often lentils are mixed with cabbage, tindora, beans, cluster beans and leafy vegetables. Its been more than 2 week, my fridge is almost empty with left with small piece of cabbage , cauliflower and some carrots. I need something for dinner and also for next day’s lunch, I couldn’t think of anything other this dish, fried some perugu merapakaya’s( got from India) and served pickle, rasam and yogurt. Heat oil in a small pan add urad dal and red chilli, add cumin seeds once the dal starts turning in brown. Allow the cumin seeds to crackle. Add hing curry leaves , remove from heat and keep aside. Soak pesarappu for 15-20 mins. Chop, clean and rinse cabbage , keep aside. 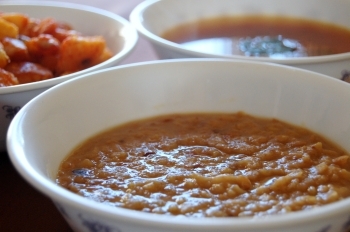 In a deep heavy bottom saucepan rinse soaked dal and add to the sauce pan with 1/4th-1/2 cup water and chopped cabbage, cover the lid , close the steam vent and turn on the stove to medium low, keep stirring occasionally, do not over mix. This will make the dal to break it will turn into pappu instead of dry pappu koora. Cook for 20-25 minutes or until cabbage and dal are cooked, sprinkle some water if the dal is sticking to the bottom of the pan. I like my cabbage little crunchy, I turn off the heat little early. Now add the salt and stir in the fried seasoning. Mix gently until everything is incorporated. At my place pappu koora is usually served with pulusu(stew), avakaya/pachadi (pickle) and vadiyalu (papadams) along with yogurt. Cabbage contatins natural juices adding salt at starting will not only delay the dal from cooking also is it will the cabbage mushy and will start smelling. You can pressure cook dal and cabbage separately for 1-2 whistles. I prefer doing it on stove top for dry version. 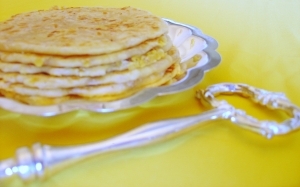 Bobbattu, a flakey Indian bread stuffed with sweetened yellow lentils is a traditional sweet from Southern India made during special occasions and festivals. The dough is called poli and the stuffing is called purnam. This is one our families favorites. 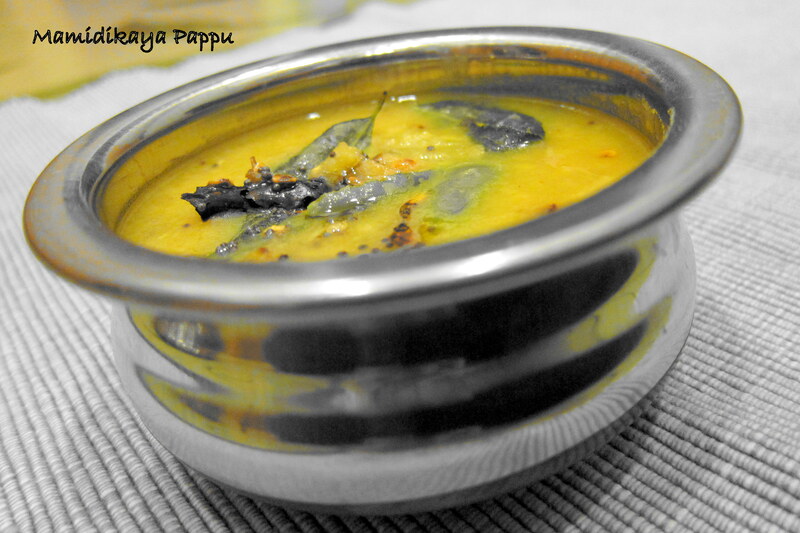 Pulihora and Bobbattu is a classic combination made during any festival. To tell you the truth I don’t like sweets. This is the exceptional one. Thanks to my mom who used to run behind me and make me eat this delicacy. Bobbattu is often served with a splash of warm clarified butter. 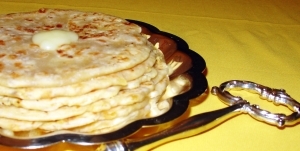 Bobbatu is also known as puran poli in Northern India. In a wide bowl mix maida , salt and water (around 1/3rd -1/4th cup) and knead into a dough, this will be of a chapati dough consistency. Now slowly add oil to the dough and keep kneading until the oil is absorbed into the dough. Cover the dough and rest it for 45-60 minutes. By this time the oil will separate from the dough. The dough will be stringy and elastic. Wash and soak channa dal for 20-30 minutes. Pressure cook channa dal with little water, less than 1/4th cup (3 whistles). Once done drain all the excess water completely. Make sure that there is no water and cool down the cooked lentils completely. 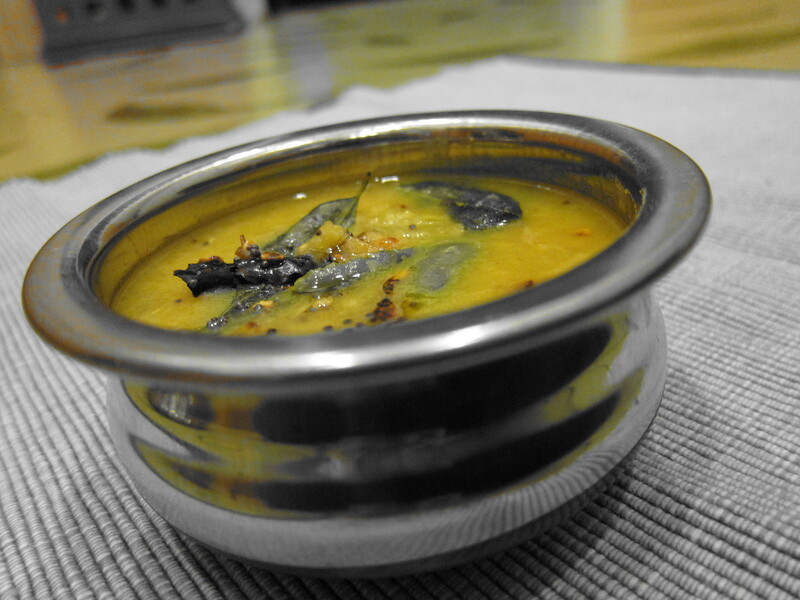 Mash this cooked dal using a potato masher. Add sugar, cardamom powder and mix well. Divide the dough and puranam into balls of equal portions (lemon ball size). Take one portion of poli(dough) on a wax paper/foil/zip lock bag (traditionally banana leaf is used), apply oil (around 1 tsp) and roll out the dough into a small round with ur hand, you can use rolling pin. 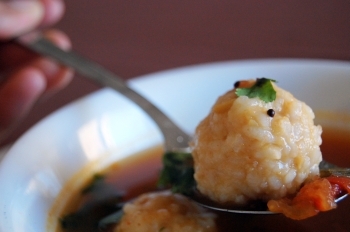 Keep the purnam ball in the middle and cover it by bringing the dough corners together. Dip your fingers in oil and flatten the ball (dough and purnam, like stuffed paratha) gently pressing the poli with your fingers from the edges to the center into to a circle, as thin as you can without tearing it (make sure the dough and the stuffing are distributed evenly). Now carefully invert the poli using a spatula or with your hand on to a warm tawa/gridle. Cook both sides until the color changes into light brown color. Flip and drizzle little ghee on both sides and remove from heat. Repeat the process with remaining purnam and poli. Serve hot or cold. You can use jaggery (grated) instead of sugar and wheat flour instead of maida. If the purnam is runny, keep in the fridge for some time and then use it. You can make the purnam ahead and refrigerate and use it when needed. You can use a rolling pin to roll the dough but I’m more comfortable with my hands. You can also use tortilla presser to press it but you should be very gentle and careful while pressing. You can refrigerate the cooked polis for 2-3 weeks in fridge or stack up the cooked, cooled polis layered with wax paper and freeze. It stays good for 2-3 months. Defrost and re-heat just before serving. Look forward for step by step pictures. I will be updating soon. Dal makhani is delicacy from punjab filled with rich proteins and fiber .Traditionally lentils and beans are generally soaked overnight or for atleast 8 hours and gently simmered on low heat along with ginger, garlic and a few other spices (garam masala).These are then combined with a tangy masala base which includes onions, tomatoes ( chopped or puree) or dried mango powder or even pomegranate seeds. Dollops of fresh cream and butter provide for the rich finishing touch. Garnished with finely chopped coriander leaves and fresh cream. 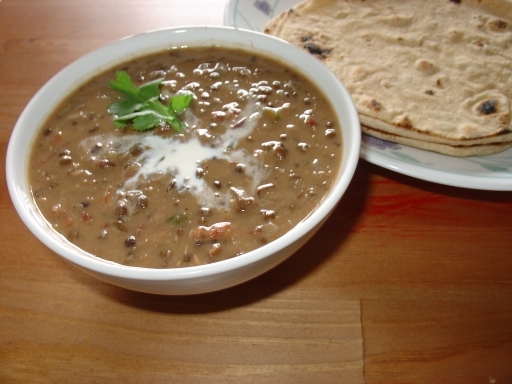 Dal Makhani takes longer to cook than the split dals, but the result is worth it. 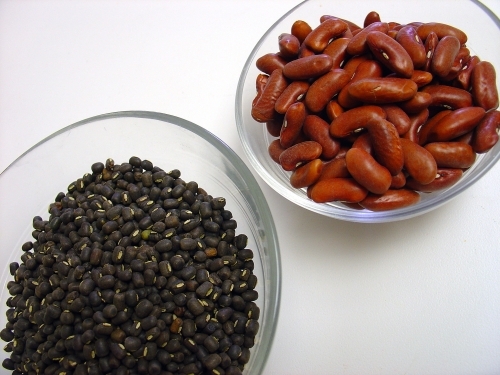 Wash and soak black urad whole and rajma overnight.Cook the soaked dal and rajma in 5-6 cups of water with salt, red chili powder, fennel seeds powder, turmeric, and grated ginger till dal and rajma are done/soft ( I pressure cooker for 10-12 whistles). Lightly mash dal and rajma mixture, keep aside. Heat oil or butter in a thick bottomed pan. Add cumin seeds and hing, let it crackle. Add ginger, garlic, chopped onions, and cook till light golden brown in color. Add garam masala and chopped tomatoes. Sauté till tomatoes are well mashed and fat starts to leave the masala. Add mashed dal and rajma to this mixture and little water ( desired consistency). Correct seasoning, and simmer at very slow flame for 15-20 minutes.Add fresh cream and let it simmer for 5 minutes and turn off the heat. Garnish with coriander leaves before serving. Serve hot with Naan or Paratha or even with rice. This recipe also tastes very good the following day after reheating properly.Soaking for longer, say overnight, reduces cooking time. You can substitue garam masala with cumin-coriander powder and cream with sour cream or lowfat yogurt. As kids (me & sis) we never liked this green vegetable because of the texture and also the taste. I vaguely remember my mom cooking this vegetable and we refused to try it, as lots of other green veggies were abundantly available. After coming to california, green veggies are not as widely available as in India, but I had a good choice and I use to excuse myself from eating this vegetable. After moving to Virginia my choice was completely narrowed down, still managed with Spinach and Methi for couple of years. Last year when my in-laws visited us my mother-in-law told me how to cook this vegetable the right way. Bachhali kura is extensively used in South-Indian cooking. 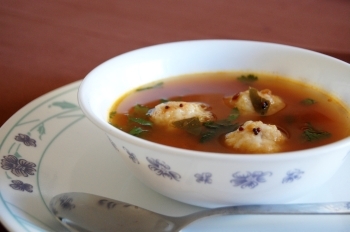 Kanda-Bachhali kura is very famous dish in Andhra Pradesh, other common dishes include sambar, majjiga pulusu. Aava pulusu, snacks and pappu. In small pan heat oil add the dry chilli, mustard seeds, and methi seeds and allow mustard seeds to splutter, add hing and remove from heat and keep aside. Heat a heavy bottom pot with little oil on medium heat. Add green chillies, onions (you can use whole of cut in half) and sauté for 3-4 mins. Add the chopped bachhalaku (leaves and stems), turmeric, salt and sauté for another 3-5 mins. Add tamarind paste little water and cover with lid and reduce the heat a little and cook for 8-10 mins or until soft not mushy. Stir in dal, grated coconut and mix well, add remaining water, increase the heat and bring it to boil, adjust the seasoning and reduce the heat a little. Add sambar powder and the seasoning and cook for another 5-8 mins and turn of the heat. 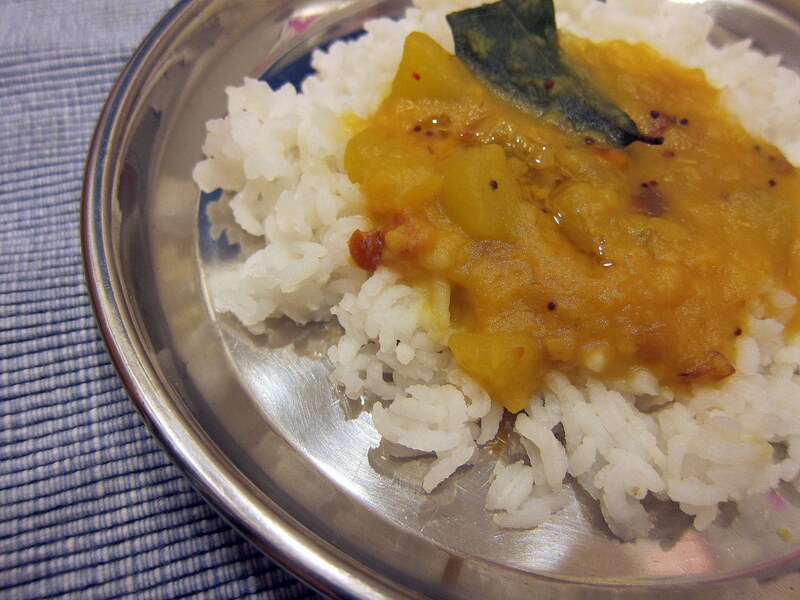 Serve with rice and papad. You can add jaggery if you like. Onions are optional. You can also add drumsticks. I like my sambar with onions. 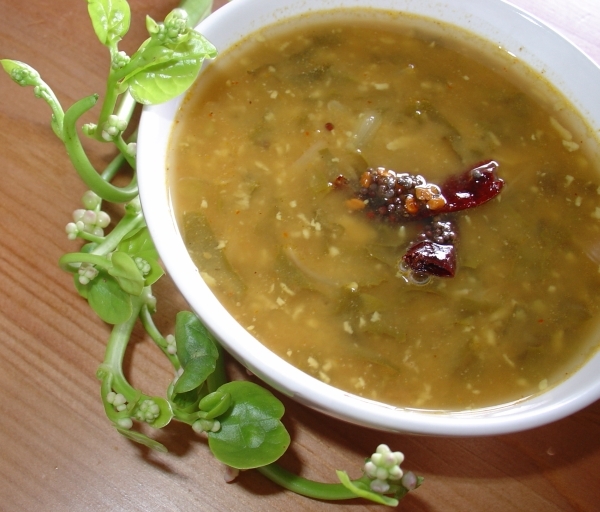 You can use / substitute spinach instead of Bachhalaku, and the dish will be called spinach sambar:).